I am sorry to see the my niece, DeeDee will only be participating in Art Work Friday's monthly. I'm sure she is busy doing other things. I know I will miss her postings. Along with making jewelry I also started making candles. I use soy wax because it burns cleaner. It does not have the puff of black smoke as it is burning. 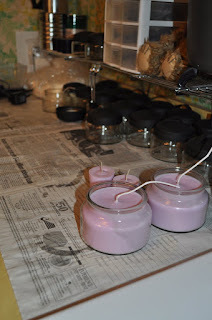 So as part of Art Work Friday for the next few weeks I will be blogging about candle making. Currently my candle making space is in my laundry room where I have counter space. This is just some of my materials. These are some candles my daughter made. They are a light purple color with lavender scent. 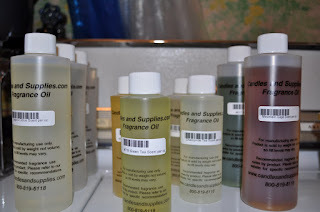 Just a few bottles of scents that I have. So come on back next Friday to see more of my candle making. What a fun hobby! 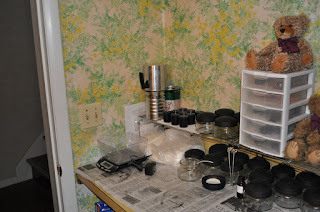 I've made candles before but years ago. Madison would love the lavender ones, it's one of her favorite scents! What fun! I can't wait to see and read more. Your candles look awesome and lavender would smell so pretty. Are they hard to make? Wish I would have thought for you to make one while I was there so that I could watch you. Next time!!! !